The Well House is conveniently located in the heart of Totnes town, the commercial centre for the South Hams. From the parking in front of the double garage, steps rise to a terrace giving access to the front door which opens into the entrance hall. The generous dual aspect sitting room features a Living Flame gas fire to which there is an attractive surround and slate hearth. There’s access to the conservatory which in turn opens to the roof garden. The dining room opens to the front terrace through French doors and further double doors open to the well appointed kitchen with space for a dining table, which in turn allows access to the conservatory. On the ground floor is a generous utility room, which has previously been used as a home office, with pedestrian door opening to the double garage with remotely controlled electric up and over door, water, power/light and parking. The second floor houses a large master bedroom with dressing area and Jack and Jill shower room. To complete this accommodation are two further bedrooms serviced by a family bathroom. 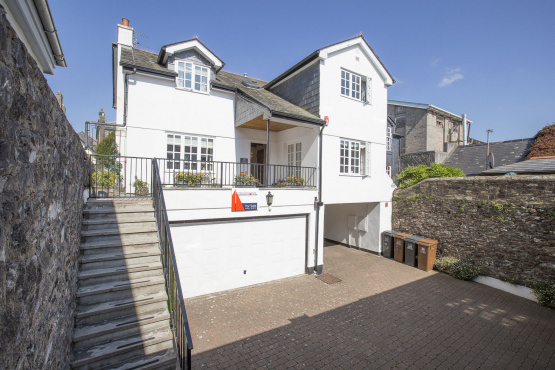 The Well House is offered to the market with a guide price of £459,950. For further information please contact Marchand Petit’s Totnes office on 01803 847979.